German politician Hans-Christian Ströebele (right) with the NSA whistleblower Edward Snowden in Russia. (Photograph: Hans-Christian Ströbele/EPA)In the short-term, NSA whistleblower Edward Snowden appears unlikely to travel to Germany in order to testify about his knowledge of how the U.S. spy agency has used its surveillance capabilities to bulk-collect the communications of the nation’s people, including the personal cell phone of Chancellor Angela Merkel. However, in an open letter delivered to the German government on Friday, Snowden—still living under temporary asylum in Russia—indicated he is willing to assist the investigation of alleged spying once the “difficulties” of his personal situation are resolved. According to the Associated Press, Germany’s Interior Minister Hans-Peter Friedrich, said Friday that he “will try and find a way for Edward Snowden to speak to German officials” if the whistleblower is willing and able to “provide details about the NSA’s activities” concerning the alleged surveillance. How that might be accomplished remains unclear. Hans-Christian Ströbele, the veteran Green party candidate for Berlin’s Kreuzberg district, reported that the US whistleblower was prepared in principle to assist a parliamentary inquiry. For the moment, however, with a standing warrant for his arrest, Snowden is unlikely to return to the U.S. until he is offered assurances that he would face a fair hearing. Given the treatment of other whistleblowers by the Obama administation, defenders of Snowden have said it would be irresponsible and dangerous for him to return. 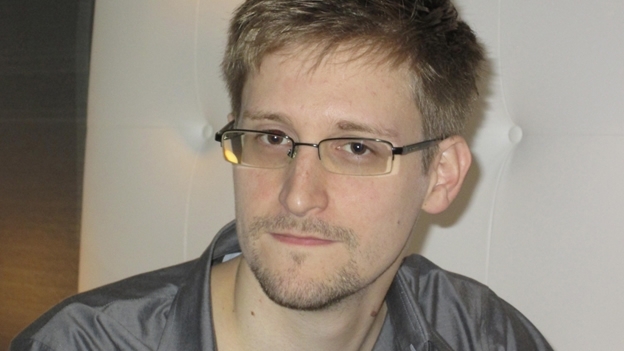 Norman Solomon, co-founder of the online advocacy group RootsAction, has argued that the U.S. government deserves rebuke for revoking Snowden’s passport in the first place. In an email to Common Dreams, Solomon said events this week have only underscored the importance of restoring Snowden’s freedom to travel. If his passport was reinstated, Snowden could “present vital testimony to parliament in Germany” and elsewhere. “If any committee chair had the guts to fight for a single day of immunity from capture, he could present vital testimony to Congress in the United States,” Solomon said. As of Friday, a RootsAction petition calling for Secretary of State John Kerry to reinstate the Snowden’s right to travel had garnered more than 35,000 signatures. Congress has in its power the ability to bring home the man without whom all the abuses, errors, and oversight workarounds would have continued unchecked. Five years ago, when Congress passed the Fisa Amendments Act, the legislature included in that statute a set of provisions that immunized the telecommunications companies that cooperated with the Bush administration’s warrantless wiretapping program from civil suits by citizens whose rights had been violated and from states that wanted to investigate or sanction these companies. That provision was roundly criticized by civil liberties advocates, but it does provide a legislative model for what Congress could now do to protect Snowden from criminal or civil liability arising from his disclosures. Critics say that Snowden broke the law and should pay the price; they argue that facing the consequences is what civil disobedience requires; that is what we learned from Martin Luther King, they say. But do they really believe that ultra-segregationist Bull Connor‘s arrests in the civil rights era were justified?